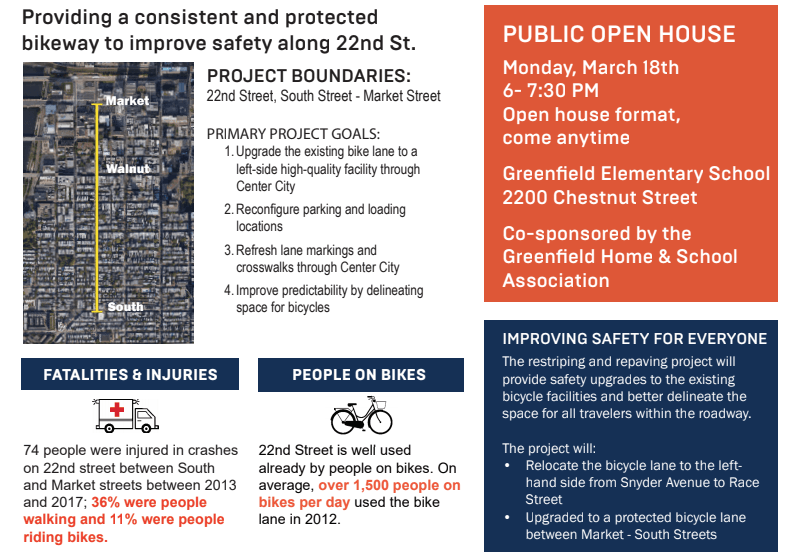 As part of its ongoing work to make Philadelphia safer for pedestrians, cyclists and motorists, the City is hosting a meeting regarding a new project along 22nd Street, which will make the bike lane safer via a partial-protected bike lane. The meeting will be held at the Greenfield Elementary School at 2200 Chestnut Street on Monday, March 18th, from 6pm-7:30pm. Those interested are invited to show up at any time. The meeting will be presented in an open house format. Twenty-Second Street is one of the most used bike lanes in the City of Philadelphia. More than 1,500 people on bike use the lane, per day, according to the Office of Transportation and Infrastructure Systems’ counts. Move the bike lane from the right to the left. Install a standard bike lane between Snyder and South Streets—similar to what already exists, except on the left. 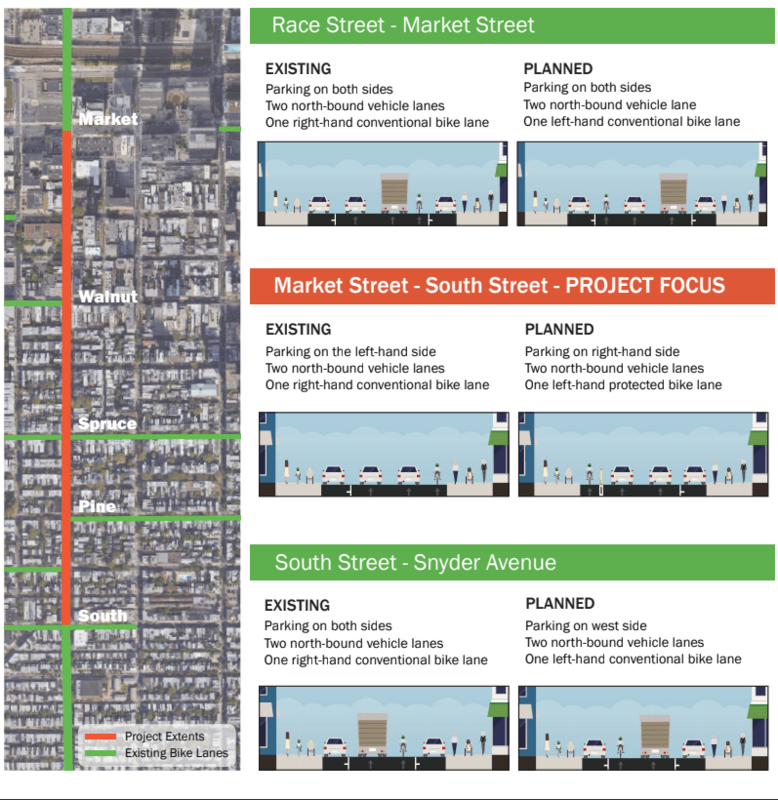 Install a protected bike lane between South Street and Market Street. Install a standard left-side bike lane between Race and Market Streets. We assume there are questions about this plan. That’s why we suggest everyone interested go to the meeting on March 18th and make their questions and concerns knows. In addition to the questions you have, it’s important Philadelphia’s cyclists come out to this meeting, as they have in the past, to support updating our infrastructure. You can make streets safer. Join us on the 18th to do just that. This is all well and good, but why not make it parking protected as well? The proposal for placing the bike lane the north and south sections (colored green on the map above), on the street side of parked cars makes bikers vulnerable to both getting hit by passengers opening car doors without looking to see if a bike is coming, and getting hit when a vehicle suddenly, without signaling or looking back on the bike lane, pulls into the bike lane for a short stop. Safer than this is what is proposed for the South St to Market St stretch (orange in the above map): the bike lane between the sidewalk and the carpark lane. Protection of the bike lane from incursion by parking vehicles would be essential.